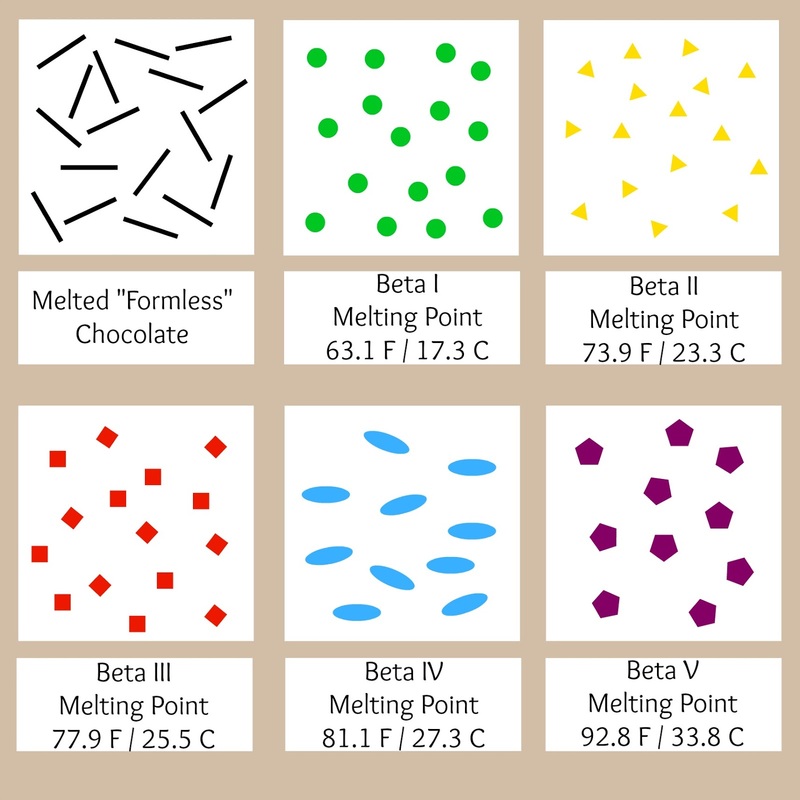 Tempering chocolate is one of those things that is scary to even think about. 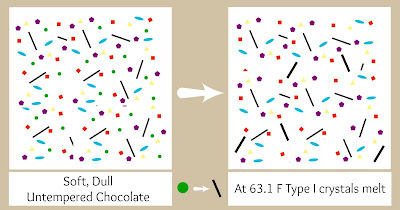 But if you know a little chocolate science (which we’ll address) and follow our instructions, we can almost guarantee chocolate tempering success for you. We say almost because there are sooo many factors that affect chocolate. But don’t get overwhelmed. It really isn’t hard. The first thing you notice is the appearance. It has a smooth. shiny surface. It should be crisp and snap when you bite it. No crumbly-ness. Now for the science-y part. We’ll try not to get too technical, but know that understanding the chemistry of chocolate makes it easier to temper simply because you know what you’re trying to achieve with each step. Here we go..we’ll try not to lose you. In a nutshell, tempering goes like this: Melt the chocolate. 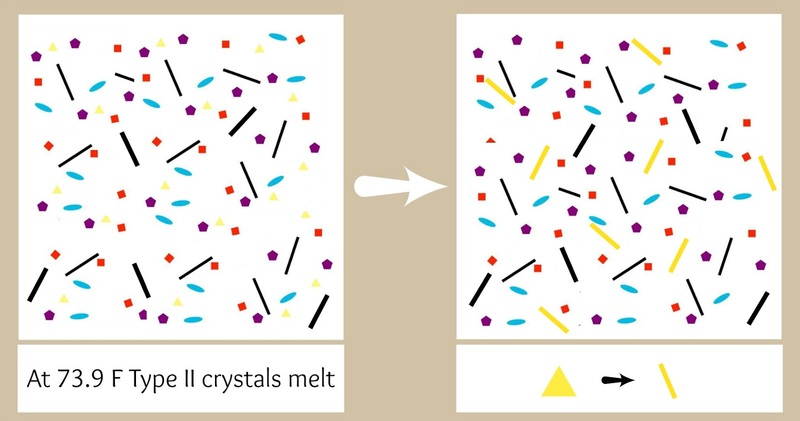 Cool the chocolate so that the 5 crystals “reappear”, then slowly bring the temperature back up to melt all but the beta V crystals. 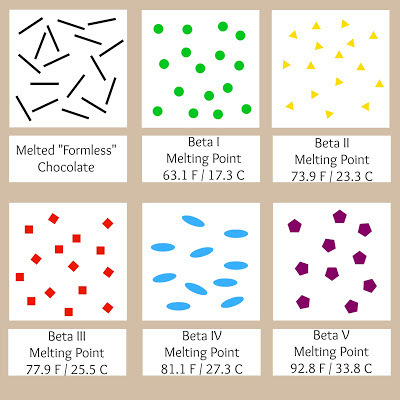 Okay, so the graphic below shows melted chocolate at or above 100 F. (Don’t go above 110 F. It can burn.) 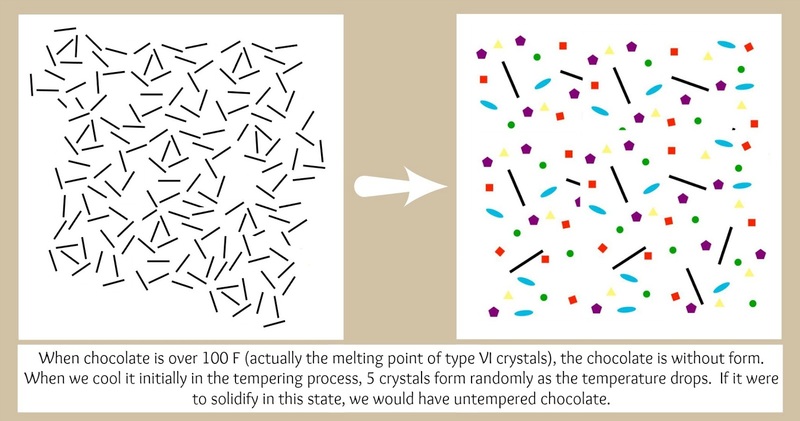 As the chocolate cools, 5 crystals randomly form. 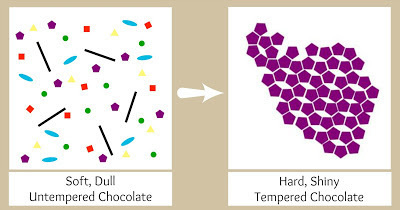 If it were to cool completely and solidify in this state, it would be soft, crumbly untempered chocolate. 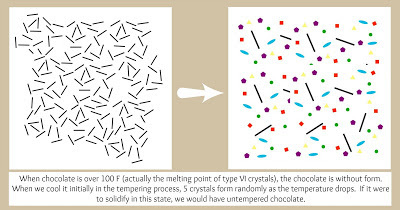 Since the goal here is tempered chocolate, we need to take some more steps. 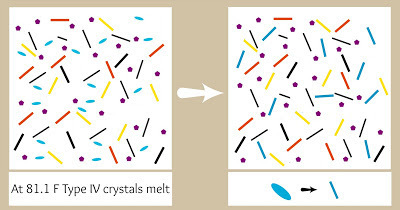 We need to re-melt all but the beta V crystals and get them to align. It’s really not as complicated as it sounds. 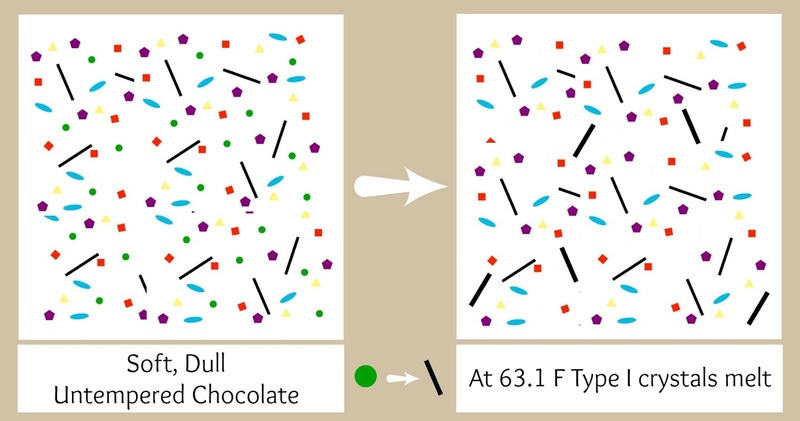 It’s all about watching the temperature of the chocolate. So, the melted chocolate has cooled to 80 – 82 F. Wait…back up. 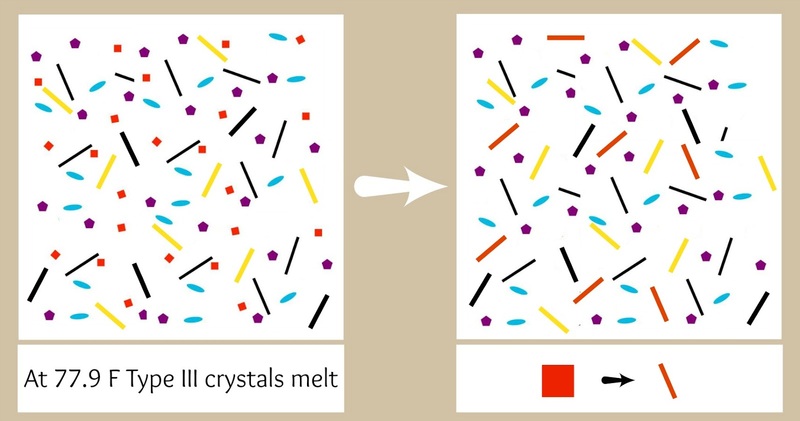 How do we cool the chocolate? You could let it sit, stirring often. That would do the trick, but it takes forever. What we do is add some unmelted chocolate. 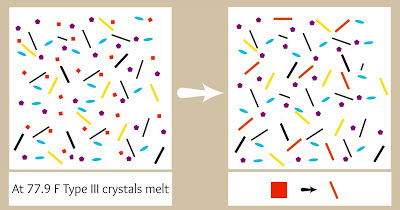 After chopping your chocolate, only melt about 2/3 of it. The remaining 1/3 will be your “seed” chocolate – the chocolate you add to cool it. Okay. Slowly bring the heat back up. Get yourself a good chocolate thermometer and watch the temperature. You want to bring it back up to 86 – 88 F.
s. Once you get to 88 F (no higher than 89 F), take the chocolate off the heat and STIR. Stir, stir, stir. Chocolate LOVES to be stirred. 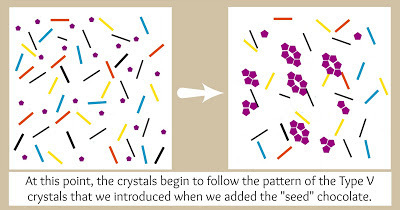 The beta V crystals will begin to form around the seed chocolate and align in the pattern we want. Go ahead and dip your chocolates. 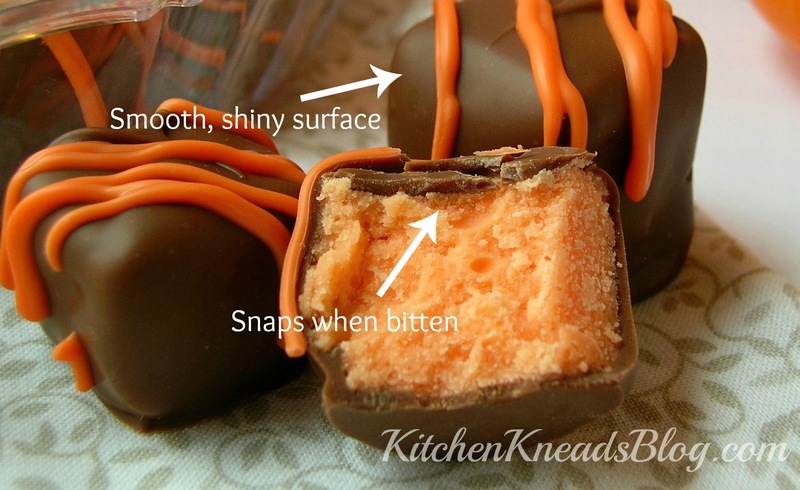 Now, your chocolate may begin to cool as you’re dipping, making it thick and difficult to work with. If this happens, VERY gently add some heat to the chocolate. But be very careful not to get it above 89 F. Your temper will be ruined if you do. However, not all is lost if you get it too hot. 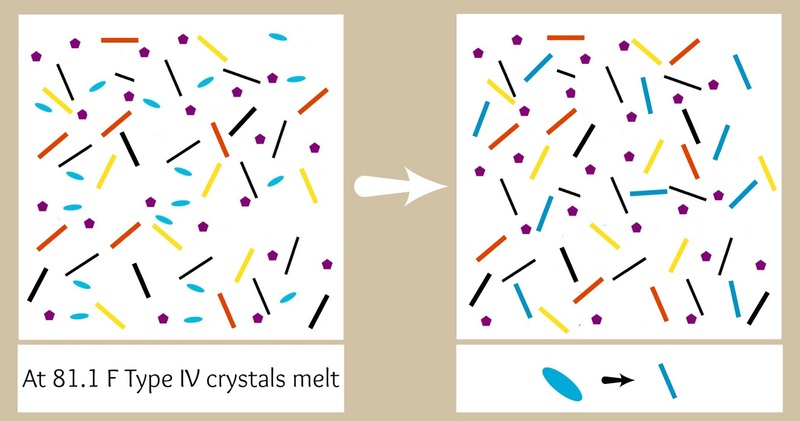 All that’s happened is that you’ve melted the beta V crystals. Just temper it again and keep going. Simple enough, right? Once you get the hang of it, anyway. 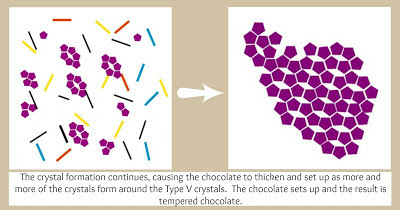 Chop your chocolate as uniformly as possible for even melting. 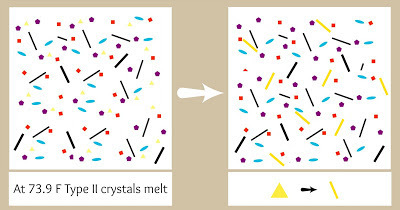 Melt about 2/3 of the chocolate, being careful to get it between 105 and 113 F for milk chocolate (I always shoot for 110 F) and 114 to 118 F for dark chocolate. Add the reserved 1/3 of the seed chocolate to the melted chocolate to bring the temperature down to 80 – 82 F. Stir, stir,stir. Be patient with your chocolate. Don’t rush it and you’ll be rewarded. Slowly and carefully bring the temperature back up to 88 F.
We were going to do some troubleshooting at this point, but this post is already long and there’s enough troubleshooting questions to make a whole other post. Stay tuned. Friday we’ll cover bloom, streaks, splotches, seizing, and more. Do you have any questions? Do you need clarification on something? Ask in the comments section below.